I hope you've started using Bloglovin' to follow all your favorite blogs. It just makes so much sense to have Bloglovin' keep track of the posts you want to read instead of checking each of your favorite blogs manually. Bloglovin' will save you lots of time – something we all seem to need more of. 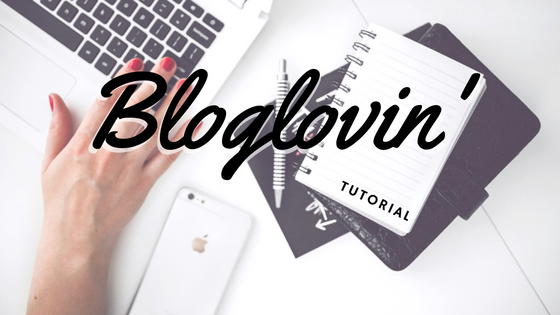 To learn about the advantages of Bloglovin' for both readers and bloggers, please take a few minutes to look at this post: Grow Your Blog Following with Bloglovin'. But do you know you can submit your own SimpleSite blog to Bloglovin' as a way to gain followers? Yes, once you've submitted your blog and 'claimed' it, Bloglovin' will suggest it to people who read blogs that are similar to yours. That's a free way to get some traffic to your blog. Free traffic is always good, isn't it? Are you ready to set up a SimpleSite blog? Just click the green button to build your FREE blog. Keep reading to find out how to complete the process of submitting and claiming your SimpleSite blog on Bloglovin'. The process may look a little daunting at first, but it's broken down into quick, easy steps. Just follow it one step at a time. NB! If you haven't already added the blog component to your SimpleSite yet, have a look at our mini-tutorial in the grey box at the bottom of this article. Sign up for Bloglovin' here. It's free and easy. Sign into Bloglovin' and click in the search bar at the top. A list will drop down. Click 'Add blog' at the bottom of the list. Leave that on the screen and open a new window and go to your SimpleSite website. Access your blog from the menu bar. Copy the URL for next step. – The URL is the web address shown in the address bar of the browser. NB! Make sure that you copy the URL from the blog page and not the URL from your SimpleSite front page or one of the standard pages. Your blog's URL should end in a number, e.g. http://www.blogname.simplesite.com/424424296. If you get a message saying 'No RSS Feed' you have not copied the URL of a page with a SimpleSite blog component. To add the blog component to your SimpleSite please follow the instructions in the grey box at the end of this article. 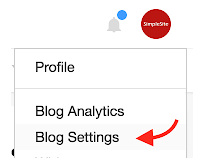 Leave your SimpleSite blog open and return to the Bloglovin' page that you left open in step 3. Paste the URL of your blog and click 'Add blog.' You'll see a message that Bloglovin' is working. Your blog should show up on the next page, but don't worry if it doesn't. It sometimes takes a day or two. And don't worry if your blog's title is 'Blog RSS Feed.' You'll be able to change it later. Still on Bloglovin', on the next page under your blog title and to the right, you should see 'Is this your Blog? Claim it!' Click that link to claim ownership of your blog. The next page has a blue 'Claim blog' button on the left. Click it. Enter the URL for your blog again and click 'Search.' Click on your blog in the search results. Leave that on the Bloglovin' screen and return to your SimpleSite blog. Create a new blog post, insert the code you copied, and save it. The post will have only the code. Success! Your SimpleSite blog has now been added to Bloglovin'. Blog settings - While logged into Bloglovin', click on your profile image and then click 'blog settings' from the drop down list. 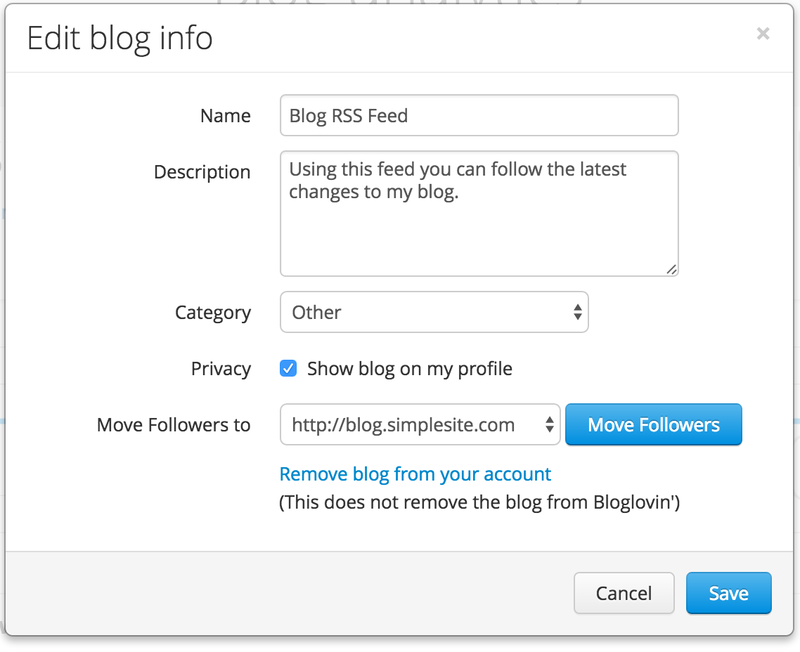 You can change the title of your blog from 'Blog RSS Feed' to the actual name of your blog. Just click the 'Edit blog info' link, type in the correct blog name, choose the category of your blog, and save. You'll see a button to 'Invite your friends to follow.' Click on that and you'll have the chance to invite friends via their email addresses or via Facebook. 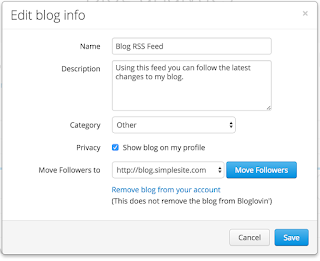 Delete the code – You can now delete the code that you copied from Bloglovin' into a post on your SimpleSite blog. Just edit that post to eliminate the code and write an actual post instead. You might take this opportunity to explain how your readers can follow you on Bloglovin'. Link to your Bloglovin' profile – While you're logged into Bloglovin', click on your profile image again and click 'profile' from the drop down list. On the next window, you'll see your blog name just under your own name. Click on the blog name and you will go to a new page with the URL of the blog in the top address bar. Copy this URL to use as a link in your blog posts and encourage readers to follow. 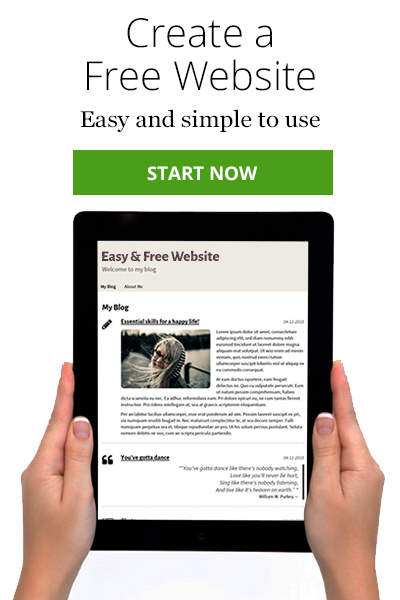 If you haven't started a blog yet, this is a great time to set up a FREE blog at SimpleSite. Just click the green button. Click the 'Blog' component to add the page where you will publish your blog posts. Exit the editing process and view your SimpleSite as a reader would. When the new screen opens, you will see 'Blog' in the menu. Click it. The URL in the top address bar should now look something like 'http://www.blogname.simplesite.com/430597530.' This is the URL you will need in step 3 in the tutorial above.